Every Friday night or so, Justin and I are lucky enough to have some fabulous neighbors who enjoy wine as much as we do. And since I'm pregnant, the wine is pretty much out as are cocktails. But, just because I can't enjoy a glass doesn't mean that everyone else can't. And so, what's a pregnant lady to do when everyone is sipping bubbly or enjoying the aroma of a terrific California cabernet? Well, I've discovered that it's not the actual cocktail that I miss, it's the experience of drinking something special! 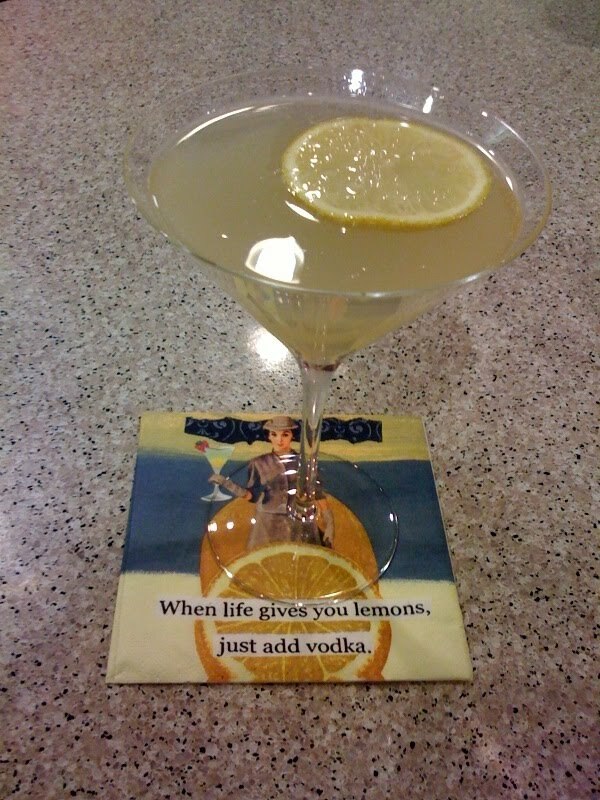 And so, that's pretty easily fixed with a slice of lemon and fancy glass! I'd love to make all of my mocktails from scratch using freshly squeezed juices etc but when I'm too tired, there are some pretty good substitutes. My favorites right now: Pellegrino Limonata with a squeeze of fresh lemon and a slice of lemon as well. And for pizza night, a good root beer in a bottle! I have to say, that drinking a soda this way actually feels really special and I treat it much like a regular cocktail- in careful moderation. I wasn't really a soda drinker in the past and this ritual of putting with fruit in a nice glass elevates the experience. What if all soda was cherished in this way? Do you have a favorite non-alcoholic beverage or mocktail? Oh, I so missed out on beer and wine when I was pregnant! I discovered that non-alcoholic beers are not bad and filled the void nicely. My favorite mocktails are sparkling water with a splash of juice and coca cola with a slice of lemon. I gave up drinking a while ago so have had a lot of chances to explore non-alcoholic drinks. I like to make mock gin and tonics using a good tonic water (e.g., Fever Tree) and the juniper soda from the DRY company. Good tonic water is easy to find, but DRY soda is not. I have found it at Whole Foods near Lake Merritt in Oakland and in Petaluma (but not at the Berkeley location.) In fact, the Whole Foods soda section has quite a few interesting sodas. Now and then I make infused syrups to mix with sparkling water. I described a Thai-ingredients variety on my blog a few weeks ago. There is plenty of room for improvisation. For info on restaurants in S.F. that make delicious mocktails, check out Sam's coverage at Becks and Posh. The comments on her three posts have good suggestions too. Wow, thanks for the ideas. I do like the juniper Dry Soda, Mark. I've seen it at Whole Foods. Mmm infused syrups sound great. I also like sparkling juice with lemon!